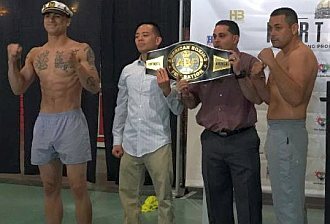 HARTFORD, Conn. (June 15, 2018) - The official weigh in was held this evening for tomorrow night's "Fight Night at The Capital" pro boxing card, presented by Hartford Boxing Promotions, at Xfinity Centre in Hartford. Richard "Popeye The Sailor Man" Rivera (7-0, 6 KOs), Hartford, CT 180 lbs. Jaime "Zarco" Solorio (12-3-2, 9 KOs), Challenger, San Quinton, Mexico 183 ½ lbs. Omar "The Beast" Bordoy, Jr. (5-0, 1 KO), Danbury, CT 140 lbs. Alexander "El Bravo" Picot (2-5-1), Hartford, CT by way of Puerto Rico 137 lbs. "The Special One" Sharad Collier (pro debut), Hartford, CT 147 lbs. Antonio Castillo, Jr. (1-0), Canton, OH 153 lbs. Anuel Rosa (pro debut), New Haven. CT 134 lbs. Roger Blankenship (1-3), Cleveland, OH 139 lbs. Nathan Martinez (pro debut), New Britain, CT 125 lbs. Henry Garcia (0-1), New Bedford, MA 125 lbs.